INDIANAPOLIS — Another game, another record for J.T. Barrett. Ohio State’s redshirt senior quarterback broke his own program record for most passing touchdowns in a single season with a 57-yard touchdown pass to H-back Parris Campbell late in the first quarter of the Big Ten championship game against Wisconsin Saturday night. The touchdown was his 35th in the air of the season, which surpassed his own record of 34 passing touchdowns in a season, which he set in 2014. It gave the Buckeyes a 14-7 lead. 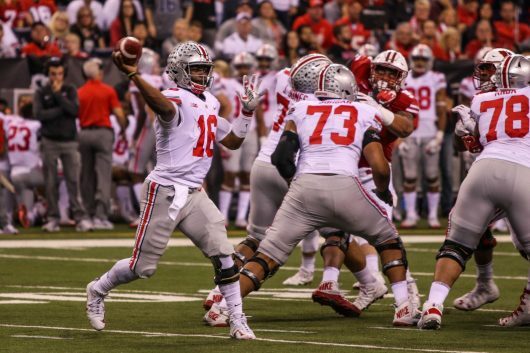 Barrett played Saturday’s game just six days after he reportedly had surgery on his right knee. Barrett holds more than 30 Big Ten and program records. Earlier this season, he set the program record for most passing yards in a career, passing Art Schlichter. In Ohio State’s 39-38 win against Penn State, Barrett set the record for most career touchdowns responsible for.